LTE (Long Term Evolution) is the 3GPP's (3rd Generation Partnership Project) new standard and accompanying technologies that mobile network operators such as ATT, Verizon and TeliaSonera are adopting for their networks. To move to higher-speed networks that can cater to customer demand for mobile broadband multimedia applications, the 3GPP has developed the latest LTE-Advanced (LTE Release 10) standard, which will be fixed in December 2010. 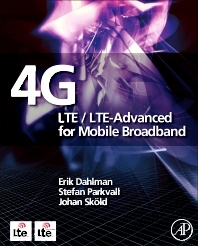 This book focuses on LTE and LTE-Advanced, and provides engineers with real insight and understanding into the why and how of the standard and its related technologies. This book is written by engineers from Ericsson--the world's leading telecommunications supplier--who was heavily involved in the development of the standard. 20.1 Where to Go in the Future? very good reference for reviewing the basics and the feature developments made over the last 9 years.